The following post requires a disclaimer. It’s not light or humorous commentary on life. Not at all. What follows is an example of why I waited so long to start a blog. I’ve wanted to–and friends have been telling me to–for a few years. When I quit my teaching job, a blog was on the to-do list. But right at the time the job ended, my father was locked in a battle for his life againt leukemia. The week prior to Father’s Day last year was one of the hardest of my life. He was dying and I couldn’t be with him. A week later I was there at his death bed. For months after he died, I simply didn’t have the emotional energy to write anything that I felt could be published, just lots of personal journal entries. I didn’t want to start a blog and only have gloom and doom to discuss, so I got myself a ways into the grieving process before I started writing with the hopes of getting published. But since Father’s Day is this week, and the first anniversary of his death is approaching, I thought it would be a good idea to talk about where God has taken me in the last eighteen months. It’s actually been very surprising, especially to me. Someone should be able to benefit from what I’ve been through. What follows is a post I wrote for a fundraising website in fall of last year. When my father was diagnosed, I committed to running a half-marathon with Team in Training to benefit the Leukemia and Lymphoma Society. For a while I entertained the fantasy that he would be well enough to cheer me across the finish line. I ran the race in his memory. This was written about six months after his diagnosis. “I haven’t wanted to update because I haven’t wanted to write. Normally, I enjoy ticking away at the computer, and it’s fun to run across an old picture that I’d forgotten about. 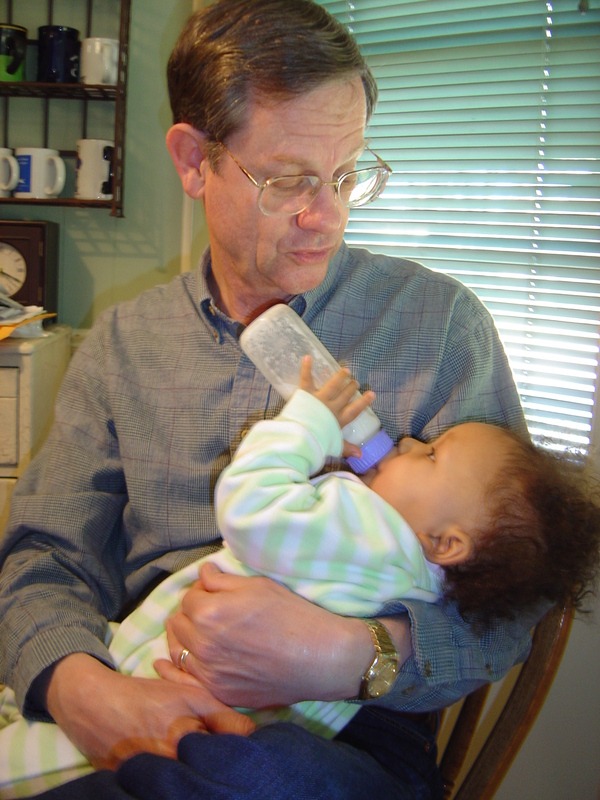 Here we have a picture—that I didn’t know existed—of my dad with my now six year old daughter. What a joy to find this little gem buried in my computer files. Yet there’s a terrible sadness I feel looking at it. It’s very difficult to put into words what this loss is doing to me. Nothing could have prepared me for this. NOTHING. There is no adequate description of grief in this world, I think. If we could describe it, then we might be able to give others a heads-up, and maybe there wouldn’t be this awful shock when a crisis occurs. I didn’t know how hard it was going to be to see my dad—my hero—sick and in pain. More than that, I was completely ignorant of how deeply you ache when you lose someone you love. What a child I’ve been. Today in church it hit me. I was listening, Mom. In fact the sermon, “What Happens When We Die”, was practically written for me. Barry even mentioned in his introduction that several church members had lost fathers recently. I know what happens when the followers of Jesus Christ die. Thank God for giving me parents that wanted me to know the truth, to know God’s Word, and to have wisdom to turn to it when I need answers about sin, grace , salvation, and eternity. I haven’t been thrown off so much by what happens when we die, but over why it’s so hard when we’re here. My despairing comment to my husband a few weeks ago was, “The world really is just a giant ant hill, isn’t it?” It feels that way. Just a bunch of insects. Here and there, a few get squashed (or some idiot fourth grader sets a firecracker off in the middle of the mound) and for a short time the rest of the insects go completely bananas. But even then, the chaos is more about getting the rest of the ant hill back to business. Todd’s response to my ant hill metaphor was spot on. He spoke without hesitation. “Yes. But God chose to redeem the ant hill.” Thank you for agreeing with me but also not letting me get away with it. It’s all there in scripture, and I periodically turn to descriptions of Heaven so that I can picture my dad, young and healthy, enjoying his reward from a loving Father—our God and our King. Having lost count of exactly how many pregnancies I’ve lost, I especially like to picture my dad playing with the gaggle of grandchildren that are with him in Heaven. Wes Prescott’s suffering is over, and I’m grateful. But I’m still here. On the ant hill. And I’m in pain. This morning the revelation was more about what good it does us to be here. God has given us little glimpses of Heaven in life on earth. My relationship with my dad is a perfect example. He was so special. He loved me so much. And being his daughter in that loving relationship gave me so much joy. As I Corinthians 13:12 tells us, “we see in a mirror dimly, but then face to face…” There is so much more joy to be had. This loving daddy/daughter relationship is a very, very faint echo of a relationship that cost the Father His Son, and the Son His life. I was bought at an enormously high price, so that I could enter into the joy of my Master at life’s end. In Heaven with God. Where Jesus is. Where my daddy is. But that’s not all. If we are allowed some shadowy awareness of the joy of Heaven, then certainly God in His wisdom exposes us to a tiny fraction of torment—just a bee sting, really—in comparison to Hell. I could run through a list of all the things that make this life so hard—with disease and loss topping the list. The hardest thing to describe about my grief is how awful it feels to be separated from my father. I’ve told my husband so many times that I just want to be able to make a phone call and hear his voice. The scene that plays over and over in my head is the last time I hugged my dad. It was June 1, 2011. I feared it would be the last time, and I was right. It all came to such an abrupt end. Without the cross, I’d have no hope of seeing him again. The real lesson for me here is not about my father, but about my Father. If I feel such pain just trudging my way through the grieving process, how would it feel to face death without ever a hope for a hug and “I love you” from the Lord Jesus? If I feel sorrow that drives me to my knees in prayer, then how unspeakably horrible would it be to have no hope of my prayers being heard? If my relationship with my daddy could be so precious to me—as imperfect as we are—how grossly have I underestimated God’s love for me—that He would purchase me from Hell with the life of His only Son? The cross is truly a rescue. I’m still angry periodically about this whole ant hill thing. Why IS it so hard? I can’t point to a scripture to answer the question, but this seems reasonable. Do you look for healing if you aren’t aware that you’re sick? Would I pay any attention to someone pointing the way home without first knowing how lost I am? And this one’s the kicker: Without sorrow, would I ever crave joy? I’m certain that the answer is no, because I have never hungered for joy like I have in the last six months. I guess you have to have some frame of reference for Hell in order to feel homesick for Heaven. Katie, God has given you insight and a gift of pouring out your heart to minister to those who are in sorrow and pain.